0,7 l - 68% vol. alc. Absinthe Nouvelle Vague means in English "New Wave" and the meaning is clear from the fact that help in addition to traditional absinthe herbs, coffee and cocoa flavours with aromas of this complex composition are used. A more modern Absinthe Nouvelle Vague presents itself here in front of the absinthe community. Nouvelle Vague absinthe should be diluted in a ratio of 1:2 - 1:4 with ice-cold water and sugar or Sirop de Gomme easily be sweetened to round out the flavor. 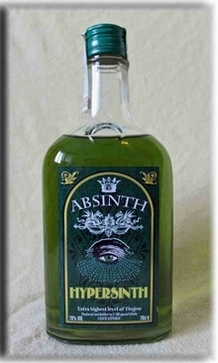 This Absinthe is coloured green with natural herbs.